The sound of a chainsaw rises discordantly above all natural sounds, disrupting the quiet of a warm African winter day, a destructive sound at odds with the African wilderness. But it is not a tree that is being felled. It is the horn of a rhino. I am standing knee-deep in thorny bushes at Ndumo Nature Reserve, on the northeastern border of South Africa, bordering Mozambique. Amos Tembe, the conservation manager, had decided, for the first time in the reserve’s history, to dehorn its remaining population of rhinos. 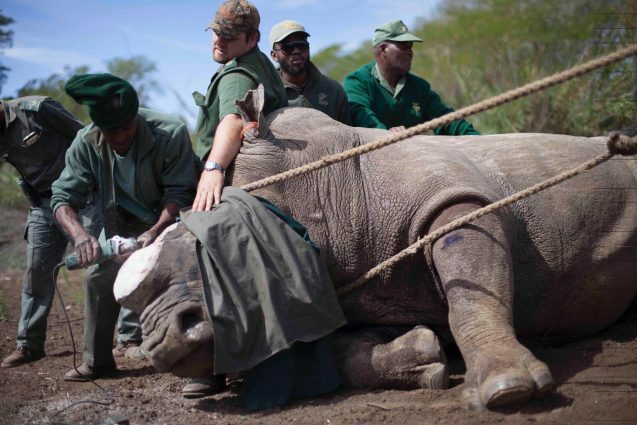 Dehorning a rhino is a desperate attempt to save the species by removing the incentive to poach. The value of rhino horn on the black market is said to be as high as $100,000 per kilogram, making it one of the most expensive commodities in the world. It commands a price higher than cocaine or gold. It is this market price that puts wild rhinos at terrible risk. They roam within their patrolled reserves, walking slowly in the wilderness with gold bull’s-eyes in the middle of their faces. Ndumo’s rhinos are living dangerously close to the border with Mozambique, where poachers can easily slip in and out across a dry river bed, taking with them a horn as an escape-bid from desperate poverty. Many do not return, shot dead by anti-poaching rangers. They are sent back across the border in pine boxes, leaving behind families in deeper poverty. This is a crisis affecting both people and wildlife. There are no winners other than the criminal syndicates at the helm of the international trade in wildlife products. They are often the same syndicates shipping weapons, people and drugs. The global surge in illegal wildlife trafficking today threatens more than 7,000 species of wild animals and plants, according to the first ever World Wildlife Crime report, published by the United Nations Office on Drugs and Crime (UNODC) earlier this year. The sixth and last rhino to be de-horned lies in front of me, shaking from the effects of a tranquilizer called M99. This powerful drug is up to 3,000 times stronger than its relative morphine. A single drop on the skin is fatal to humans, but will quickly immobilize an elephant or rhino. Once darted, the rhino falls to the ground, entering a suspended state of life—awake and yet asleep. The first step in dehorning rhinos is finding them within the vast wild spaces of a wildlife reserve. Earlier that morning, a team of armed rangers set out on foot, searching for the familiar rhinos they protect daily. Once their locations are known, it is quicker to send the helicopter to their approximate spot. Helicopter and vet time, charged by the hour, is expensive. For the last rhino of the day, the pilot was unable to chase it into a clearing. Dave Cooper, a seasoned wildlife veterinarian, decided to take the shot anyway, shooting the well-aimed dart from the sky, perfectly hitting the rhinos’ rump through a gap in the maze of thorn bushes. Cooper then dropped a roll of toilet paper from the sky to mark where the rhino fell—a manmade trail easy to spot both on the ground and from the air. The helicopter retreats to find a clearing to drop off Cooper, who continues back toward the rhino on foot. The helicopter remains his eyes in the sky, directing him toward the toilet paper marker. A radio signal is the cue for rangers and ground staff, including myself, to speed in vehicles toward the location of the downed rhino. I know we are close, but we can’t find the rhino. The thick bushes make it almost impossible to see more than 10 feet ahead. I run, following the green uniforms of armed rangers, my heart beating with adrenalin as I try to keep up. Thorns keep catching my cap, my hair, clawing me back. There is confusion. Rangers are whistling, and running ahead, seemingly in different directions. Their machetes help hack a trail through the stubborn thorn bushes to where at last we find the rhino. It’s on its side, fallen, quivering with the effects of the tranquilizer. It’s important to find a tranquilized rhino quickly. The weight of a rhino on its side can constrict its lungs and stop its breathing, which makes it urgent to move it into an upright position on its belly. Although the rhino is tranquilized, it is not asleep and can still “wake up” if stimulated. To prevent a rude awakening, it is first blindfolded. Then, rhino-sized earplugs the size of my hand are placed in its ears. Next, 10 strong men push, heave, push and grunt in unison to turn the two-ton female onto its belly. Immediately rangers begin hacking at the bushes around the rhino to make more space for when the rhino wakes up so it doesn’t injure itself. A sense of urgency hangs in the air. The longer the animal is tranquilized, the higher the risk of accidental death. “Anesthesia is controlled death,” comments the visiting vet standing next to me, Dr. Wendy McCulloch, from Manhattan. The horn must come off, and quickly. Dr. Rohan Leeming, a young trainee vet, starts the chainsaw. It roars into action, a familiar sound, but put to an entirely different use. With intense concentration, Leeming starts on the smaller of the two horns. It is cut through in seconds. Like sawing through wood, off falls the horn. The spectacle of a chainsaw at the face of a living animal is brutal and I have to remind myself that it is painless. Made of keratin, the horn is similar to our hair or fingernails, and it hurts no more than a pedicure. Next is the bigger horn. It isn’t large in the scheme of the rhino kingdom, rising strongly in a slight curve upwards, but is still approximately two feet long. The chainsaw hits the horn and flecks of rhino horn sawdust fly through the air, covering the ground in a white snow, like a thousand nail clippings. By dehorning, we destroy the one feature that makes a rhino a rhino. 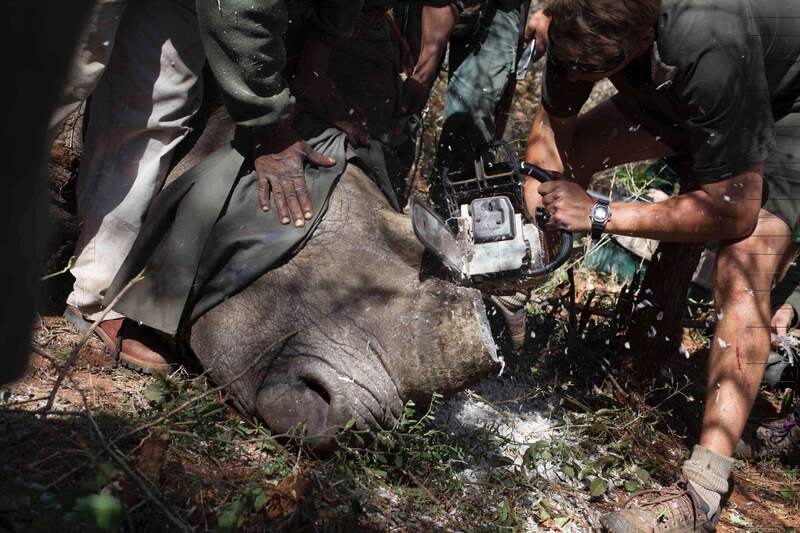 At one point the blindfold slips, and the rhino’s eyes are open, seemingly able to see the chainsaw at its face. A ranger gently puts his hand over its eye, sparing it from the sight and stimulation. The large second horn lies on the ground where it fell before it’s picked up by the park ranger, photographed, numbered with a black marker, recorded in a logbook, and ready to be shipped, catalogued and stored in a secret location. 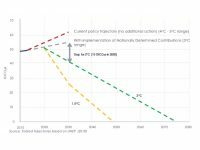 Underfunded government and private reserves are hedging their bets. If the international trade in rhino horn is legalized, this horn, weighing in at around 4 kilograms, equates to over $300,000 USD in potential revenue, helping to offset expensive security and funding conservation work. For now, while the legalization debate rages, the stockpiles grow. And the rhino death toll rises. A burning acrid smell is left in the air. After the horn has been detached with the chainsaw, the vet uses a sander to grind the horn down as far as possible, to mold it slowly into a smooth round nub. A baby bump. And with that, 40 minutes after running to the prone rhino, we make our retreat, leaving the vet to administer the reversal drug and make his own fast exit. The helicopter in the sky makes sure the rhino is able to stand, and hovers above long enough to make sure she walks away to a safer future. “Finally, finally, my rhinos are safe”, said Amos, the conservation manager for Ndumo that evening. He planned to take a much-needed vacation visiting his wife and son, who live off the reserve. With the rhinos so close to the dry riverbed and in imminent danger, he’d not been able to take a single day off, or rest well, worried for their fate. Today is Sept. 22‬, World Rhino Day, exactly a month since I stood among the thorn bushes at Ndumo Game Reserve, witnessing the dehorning of their last rhinos. Today is an important day to bring global awareness to the conservation crisis facing all five of the remaining species of rhinoceros: the black and white rhino species in Africa, the greater one-horned (Indian) rhino, the Sumatran rhino and the Javan rhino in Asia. Sadly, rhinos today are in grave trouble with little cause to celebrate their 15 million years of existence. According to the International Union for Conservation of Nature Red List of threatened species, three of five rhino species are classified as critically endangered. It is their very uniqueness by which we identify them as a rhino which makes them a target for the illegal wildlife trade: their horn. South Africa today, home to an estimated 83 percent of the world’s remaining African rhino population, has been in the cross-hairs of a violent escalation in poaching since 2003. In 2007, 13 rhinos in South Africa were killed for their horns. By 2014 the death count had risen to 1,215 rhinos. Last year, 1,175 were killed, a slight dip in the trend, but not a sign that the tide has been turned against poachers. The pressure remains relentless. Parks and private reserves are forced to spend the majority of their conservation time and dollars in costly security, just to hold the tide of poachers at bay. While the major threat for most species is habitat loss, for rhinos it is poaching, feeding demand for its horn for use in traditional Chinese medicine. The recent surge in rhino poaching is linked to the rise of a new end-use market: Vietnam. In a twist on its traditional medicinal use, it has morphed into a luxury item, a party “drug” for the elite. It’s also rumored to cure cancer. When last in South Africa, a ranger told me the shavings aren’t worth as much by weight as the full horn. The large horn, while being slowly ground down to a powder for consumptive use, is also an item of excess, a show of wealth on a shelf. One week ago, I received this text message: “Ndumo Game Reserve—Female white rhino which was dehorned in August 2016 shot and killed. Remaining horn was removed. Staff on scene at the moment and the incident is related to a shot heard in the area three nights ago. KZN TOTAL: 100.” My heart sunk. 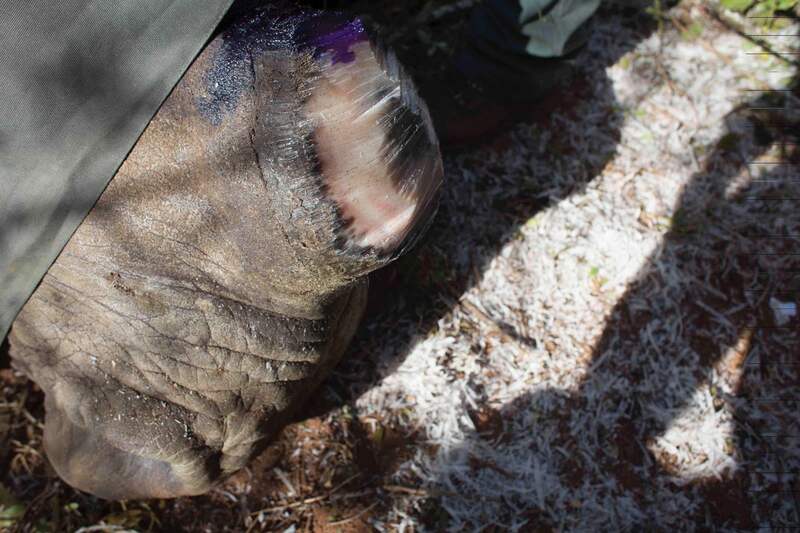 This became the 100th recorded rhino poached in the Kwazulu-Natal (“Zululand”) region this year. The past two weeks of poaching have been worse than the vets and rangers can remember. The largest national park in the country, Kruger National Park, has heightened its security, and it is feared poachers have moved on to Zululand as their major focus. Rhino 100 was the rhino I’d personally helped to dehorn, to photograph, to touch, and to send on its way to a safer de-horned future. Apparently it wasn’t enough. This young rhino met a terrible fate, poachers hacking open her face to remove what little remained of her horn. Was it out of spite, or expediency so as not to waste effort next time in tracking an already de-horned rhino? Was the rhino still alive when this atrocity was committed? I’ve seen the skull of a poached rhino. The scars of an axe or machete mark its face even in death. It is a brutal act and a brutal trade. I also heard news that another poaching incursion at Ndumo had left a rhino alive, after poachers found it had been de-horned. Its missing horn had saved its life. Dehorning rhinos is a desperate attempt to save the species until a better solution is found. What that solution will be is still up for debate. In the meantime, conservationists, anti-poaching units, park rangers, wildlife vets and non-profits supporting on-the-ground efforts to tackle poaching all need support from the international community to defend wildlife. Let’s not let rhino number 100 die silently today on World Rhino Day. Wendy Hapgood is a 2016 Master of Sustainability Management candidate and the director of the Wild ‪Tomorrow‬ Fund. Congrats to you, Wendy Hapgood. You are fighting the good fight by telling the story. I’m proud to have had you in my class. This is great.